Hard to believe that so much destruction could happen in one city and that this was one of hundreds around the world. If 100 people die in a conflict these days theres uproar. Heres some useless information for you. After the armistice was signed at 4am at the end of WW1. The fighting was only scheduled to stop at 11am, between these times 8,000 men were pointlessly killed in action. Mostly Americans who's general wanted to take 3 yards of nothing in particular. Make me glad that we have discriminate killing methods these days! 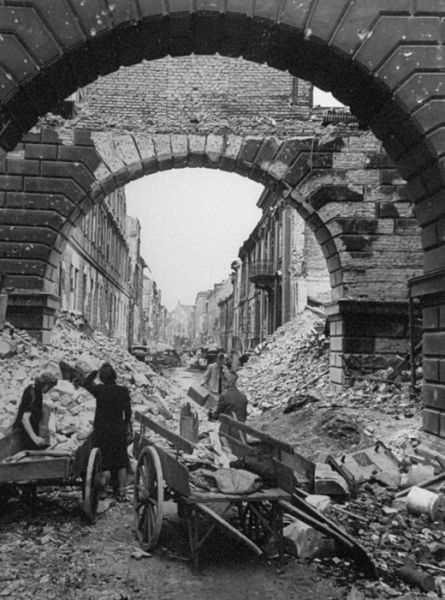 Warsaw wal totally destroyed by Germans, only piles of stones were left, and after WW2 the city was completely rebuilt. Berlin's destruction is nothing comparing to our capital city. Why you remove my comment? What a shame. Devastation of historic cities and killing hundrends of thousands of civilians is an "epic failure" of humanity. Blaming innocent people of "deserving it" just because they were born at the wrong time and place is a idiotic as it gets. OOO so so sad, They've made run over Europe, and killed millions of people, just because of psycho painter with one nut told them , they should rule the world, treating him like a god, to the moment, when they realised they can't win. And then saying- "We didn't do nothing, nasty nazists did everything." Please, Italians feel more responsible for all bad things from WW II.